Medis' Power Pack, A Disposable Fuel Cell | OhGizmo! By David Ponce on 01/18/06 • Leave a comment! Think of it as a disposable fuel cell on crack. Or speed. Or some such thing. See, the idea is that your various electronic gadgets need periodic refueling, even when you’re deep in the woods and the Power Pack from Medis Technologies promises to deliver up to six charges (for a standard cellphone) or 20 hours of talktime from one $10 to $15 disposable cartridge (if bought via your cellular carrier). 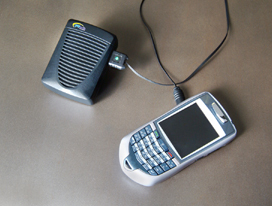 Substantially more hours of operation relative to cost; the ability to start a cell phone depleted of power in seconds rather than minutes; the ability to power a number of different devices; the use of a built-in fuel gauge that tells the user how much fuel is still available; and the avoidance of reverse polarity which discharges the cell phone battery when the charger is left connected.